Marijuana stocks would be the ultimate growth play if investors weren’t already so fired up. It just got easier for U.S. investors to bet on pot’s big plans. Toronto-based Cronos Group Inc., which invests in medical marijuana producers, on Tuesday became the first marijuana company listed on a major U.S. exchange. Analysts expect its revenue to reach $34 million this year, up from $400,000 in 2016. Cronos’s debut follows that of ETFMG Alternative Harvest ETF on Dec. 26, the first U.S.-listed marijuana exchange-traded fund. If ETFMG’s popularity is any indication, Cronos will soon be awash with money. 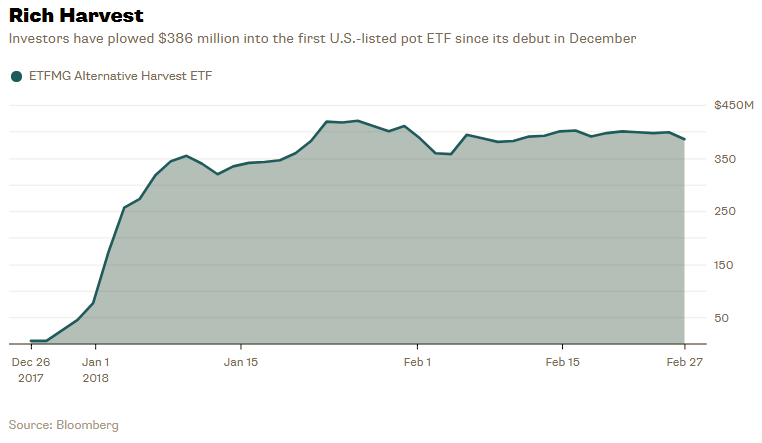 Investors have already poured $386 million into the ETF through Tuesday. It’s easy to see what all the excitement is about. ETFMG’s largest holding is Cronos, and analysts expect similar growth from its stable of stocks. Consider Vancouver-based Aurora Cannabis Inc. and Ontario-based Canopy Growth Corp., two of the biggest producers of medical marijuana and the fund’s second- and third-largest holdings. Analysts expect the two firms’ collective revenue to climb to $446 million in the 2019 fiscal year from $44 million in 2017, a 914 percent jump. The bonus is that, unlike typical growth companies, there are fewer unknowns around marijuana. Growth stocks are often a bet on new and unproven technology. But there’s already widespread agreement that pot has many beneficial medical uses — and there’s little doubt about its recreational efficacy. Even when new technology works, there’s no guarantee it will be adopted. Pot, on the other hand, is already widely used in the U.S. One in eight Americans polled by Gallup in July said they smoke marijuana, and 45 percent said they’ve tried it, the highest percentage since Gallup first asked the question in 1969. And when new technology becomes widely adopted, the threat of regulation — and its chilling effect on profits — hangs over firms. Just look at Google or Facebook. Or Apple, which is confronting concerns that phone addiction is a looming public health problem. By contrast, a growing number of states are relaxing their marijuana laws. Nine states and Washington, D.C., allow recreational use of the drug, and 29 states allow medical use. And unlike new technology, investors can look to existing drug regulations for a preview of how rules around marijuana are likely to work. The problem, however, is that U.S. investors are late to the pot party. The average price-to-book ratio of Cronos, Aurora and Canopy is 11.6, or six times the S&P/Toronto Stock Exchange Composite Index’s P/B ratio of 1.8. Their average price-to-sales ratio is 209, a shocking 123 times the index’s P/S ratio of 1.7. And don’t ask about their price-to-earnings ratios because none of them are profitable. Pot stocks are expensive even relative to other growth stocks. The average P/B ratio of Cronos, Aurora and Canopy is five times the MSCI Canada Growth Index’s ratio of 2.4, and their average P/S ratio is 105 times the index’s ratio of 2. Investors undoubtedly expect pot stocks to grow into their lofty valuations, and popular opinion in the U.S. appears to lend support. According to a Gallup poll conducted in October, 64 percent of Americans favor legalizing marijuana. That’s the highest level of support recorded since 1969, when only 12 percent of Americans favored legalization. That support is likely to grow because younger Americans favor legalization in greater numbers. 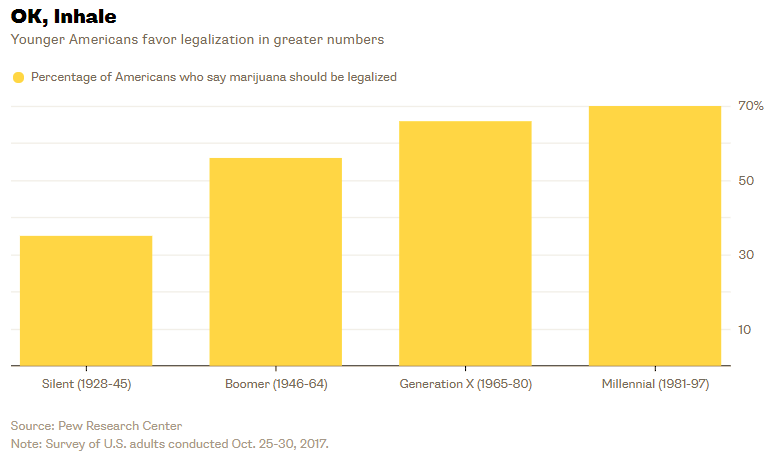 While only 56 percent of baby boomers support legalization, 66 percent and 70 percent of members of Generation X and Millennials favor it, respectively, according to a Pew Research Center survey conducted in October. It’s not just the U.S. Canada is expected to legalize marijuana this year, and roughly 30 countries already allow medicinal use, according to Bloomberg News. Even so, marijuana companies will have to execute flawlessly for investors to make money from these valuations. That’s a high bar. 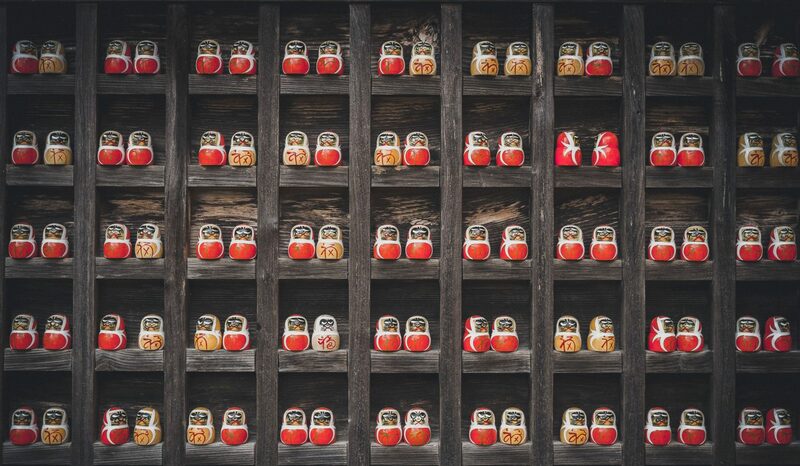 The current crop will likely face competition from new entrants, which may frustrate their expected growth. There’s also the not-so-simple matter of turning revenue into profits, a feat that fast-growing companies routinely struggle to achieve. 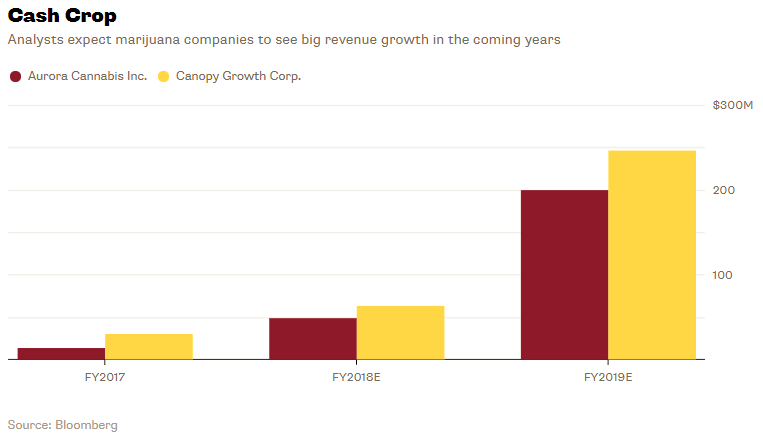 When it comes to betting on growth, reasonably priced marijuana companies would be as good as it gets. If only investors weren’t so high on them.